Health Minister Dr Dan Poulter has today announced a wide ranging series of measures to improve the training, values and education of all NHS staff over the next two years and beyond. The measures have been published in the government’s mandate to Health Education England, a new arms-length body set up to give NHS training and education unprecedented focus and importance. It will be backed by £5 billion and will be accountable to ministers for delivering the goals set out in today’s document. This special edition of the NIHR CLAHRC community e-newsletter looks at the work CLAHRCs are doing on mental health. NHS England has today (Thursday 23 May, 2013) confirmed the designation of 15 new Academic Health Science Networks (AHSNs). AHSNs present a unique opportunity to pull together the adoption and spread of innovation with clinical research and trials, informatics, education, and healthcare delivery. They will develop solutions to healthcare problems and get existing solutions spread more quickly by building strong relationships with their regional scientific and academic communities and industry. NHS England’s Chief Executive, Sir David Nicholson, said: “The NHS is full of brilliant people with brilliant ideas. To spread ideas right across the NHS means working collaboratively with all those who have an interest. 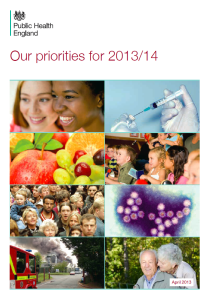 The priorities encompass the organisation’s broad remit, ranging from protecting and improving the nation’s health to building the public health system and increasing its own expertise. “We exist to serve the public through the public health system, a system led locally by elected members where responsibility for the public’s health sits alongside responsibility for jobs, housing and communities. This system is new – the combination of local government leadership for the public’s health supported by an expert national body is a first for England. click on image above to download a copy of the Guide. 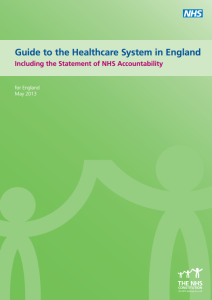 The accountability statement explains how decision making works in the NHS and fulfils the commitment set out in principle 7 of the NHS Constitution. The Allied Health Professionals bulletin is a monthly update on policy, leadership, events and resources for allied health professionals.